This is an 8 x 6 wooden apex shed. The apex feature makes for a taller and more spacious building and also ensures that the shed protects the interior from rainwater. This particular shed is different because it also manages to meet the requirements of the sustainable building code. This means it is a perfect building for a property developer to consider buying for his or her next project. 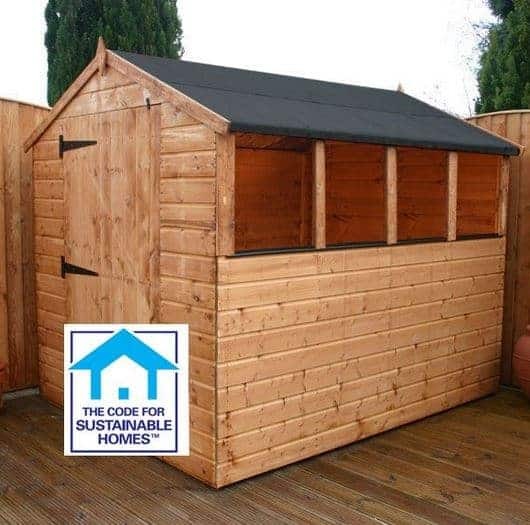 Constructed with strong Shiplap tongue and groove cladding, it provides a durable and weatherproof design. With an overall rating of 8.2, it is a popular model from this respected manufacturer. 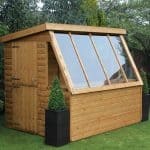 This is a wooden 8×6 apex roof shed which provides a traditional and rustic feel to the garden. The apex roof provides a number of benefits including an increased interior height. The door height measures 5”6’ while the roof height measures 6”6’. It is the upside down V-shape that provides additional interior height centrally down the shed; allowing you to store taller items as well as providing generous headspace no matter how tall you are. The depth of the building is 7”8’ and the width is 5”8’. 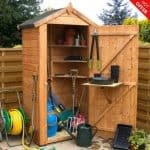 Overall it provides a good amount of space to store anything from bicycles to workshop tools and gardening equipment. The shed comes with sand felt included, providing heavy duty protection all year round. 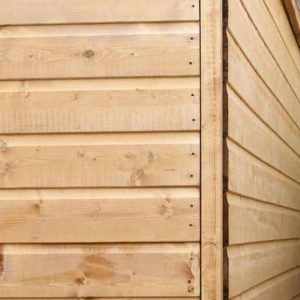 By far the most superior cladding type out there, Shiplap offers a number of benefits. Mostly it helps to create an extremely strong, high quality design. 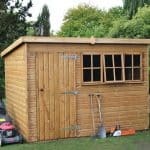 However, it also comes complete with a small groove along the timber; ensuring any water runs down and away from the shed, helping to protect against rotting and damp. Tongue and groove construction also leaves a small expansion gap, which provides space for the timber to expand if it changes due to moisture or climate changes. Waltons have used 1” x 1” framing which provides a solid structure. 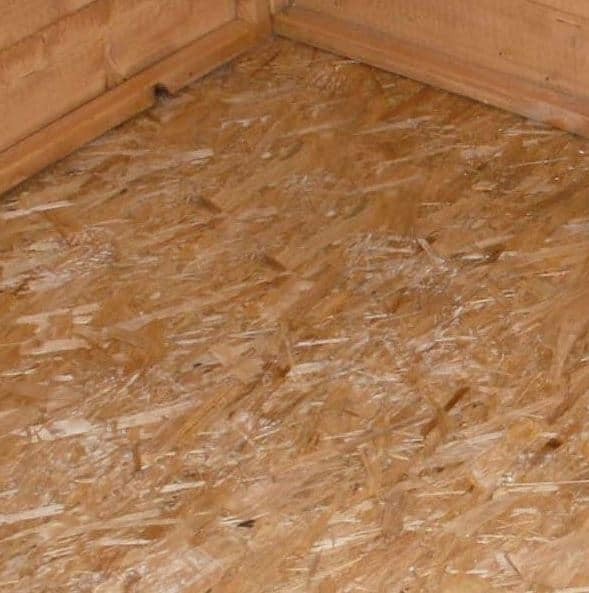 A floor is also included with the shed and it comes in the form of solid sheet material. Measuring 8mm thick, the solid sheet board gives it sufficient strength to comfortably hold your everyday gardening essentials. It is absolutely essential that you build the shed on a solid, level platform. We therefore recommend investing in the Waltons 8×6 Portabase to ensure the shed is fully supported. Keep in mind that the Portabase is not an alternative to the floor; it is simply a base to build the shed on top of. The shed does need to be treated after construction in order to protect it against the elements. However, one good advantage of Shiplap cladding is that a spirit based treatment is typically recommended. These types of treatments do not need to be reapplied annually like water based treatments. So if you’re looking for low maintenance, we advise you to opt for the spirit based treatments. We were disappointed Waltons don’t appear to include any treatments in the cost. However they do provide a 10 year anti-rot guarantee once the shed has been treated. 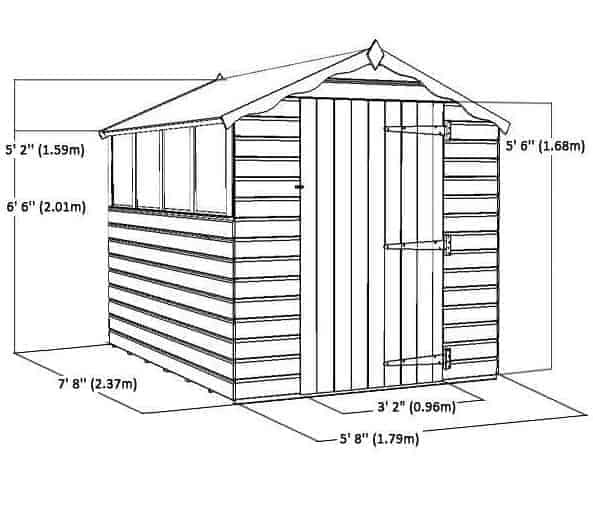 The shed comes with a single door and it provides plenty of space to comfortably move items in and out. It has a strong, sturdy design which makes it difficult to break into. We also like the fact it comes complete with a lock for added security. The windows on the shed have been glazed with 2.5mm of styrene. This makes them 100% shatterproof. Adding to the security of the shed, the windows also provide plenty of light into the building, making it easier to see what you are doing. For peace of mind, a RIM lock has been provided to ensure only you have access. However, it is the actual construction of the shed that we feel adds the most security. Shiplap cladding is one of the toughest materials to break into. In terms of privacy, the windows do allow people to see the contents inside. Therefore we don’t recommend you store anything of value. If you do need to store expensive items, be sure to properly cover them up away from prying eyes. The main customisation available is the choice of lock. As standard, the shed comes with a RIM lock. However, you can also choose to upgrade to either a hasp and staple or a BSI RIM lock. As the shed does have windows it is worth considering investing in a stronger lock to give you total reassurance. Waltons state that all of their sheds can be customised. If you give them a call you can customise the windows, door and the felt type too. 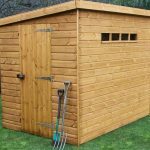 Final Thoughts: This is a high quality shed which means you it comes at a high quality cost. However, the features of the shed make it an excellent investment. You get what you pay for and that is particularly true with this model. The Shiplap cladding provides an extremely durable, secure design. The amount of space provided is also really good. You have enough space to store practically anything. Just remember that the shed isn’t very private. So while it does provide excellent internal light, the shed isn’t recommended for storing anything valuable. The fact that it has been Sustainable Homes Code Approved is also an advantage, not just to property developers but homeowners too. If you plan to sell, you will need to basically have an energy performance inspection carried out. 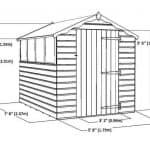 This shed will not only look good on the report, but it could increase the value of the home too. 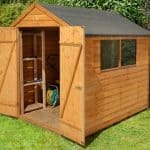 The 10 year anti-rot warranty is also a great feature, but just remember the shed does need to be treated and maintained in order to qualify for the guarantee. 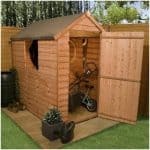 Overall we feel this is a great value for money shed which offers plenty of space and security. It will look great in any garden, but if you prefer a painted design you can always use a tinted treatment.